Throughout our lives there are many things we plan for. From little things like our workdays, where to eat dinner, and tee times, to larger things, such as planning for college or buying a new home our days are filled with extensive planning. However, there is one thing many of us often forget about the most plan-required task of all: investing. For financial advisors and investors, planning is extremely important. Part of the planning process in for advisors is creating an investment strategy that is seamless. Having a sound investment strategy is essential for investors. Developing a strategy helps them eliminate numerous potential investments that might have a poor market performance over time. Plus, it will help them discard any investments that do not fit with their investment goals that investors are looking to achieve. When investors create an investment strategy, it is essential for them to identify what they are hoping to accomplish with the strategy. An investor with a simple goal of making money or becoming wealthy is not going be helpful, nor will it likely work out. Instead, these strategies should have a more specific objective. When investors have a proper understanding of their strategy and its objective, they will be more likely to achieve their goals. And using an investment portfolio management tool, such as AlphaDroid, can help investors manage client portfolios and manage their investments. There are many different investment strategies to choose from, each one applying to certain objectives. The key to good investing is pairing the right strategy with the right objective. 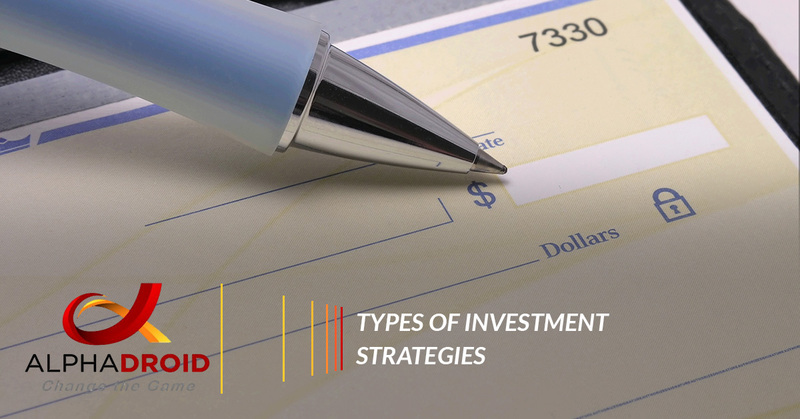 Because there are various investment strategies to choose from, we are going to cover the five types of investment strategies. 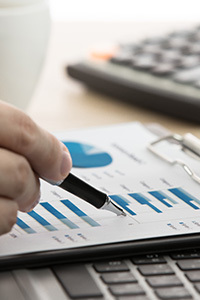 For investors who are looking to build wealth over time, income investing involves the purchase of securities that historically pay out returns on a consistent schedule. Generally, bonds are the most efficient type of fixed income security, exchange-traded funds, mutual funds, and even real estate investment trusts. Fixed income investments can provide investors with sufficient income stream with minimal risk, and depending on the level of risk investors are willing to take, they should include at least a small amount of each strategy. One of the more simple investment strategies, value investing involves buying stocks that are at a lower price than normal. Finding stocks that are at value takes a lot of research on the fundamentals of the underlying companies. Once investors locate these low-priced stocks, it often takes these time for their value to increase. Many investors and advisors utilize this buy and hold technique to earn large profits. If gaining capital appreciation is one of the main objectives of a financial strategy, investors should use growth investing. Investors that implement growth investing in their strategies search for companies that show signs of more growth than usual. This occurs through profits and revenues, even if the share price appears expensive in terms of metrics Investors who use this strategy should be cautious, though. Growth investments relatively are associated with high risk and involves investing in smaller companies that could potentially grow soon and in emerging markets. Socially Responsible Investing, or SRI investing, has been gaining popularity over the last few years. Socially responsible investing is the practice of integrating socially and environmentally friendly factors within investment analysis to avoid investing money into companies that have negatives impacts on the environment or the society, such as those that sell addictive substances like alcohol and tobacco. If investors are searching for returns that poses a significant benefit for everyone, socially responsible investing may be right for them. Although small-cap investing can add risk to an investors portfolio, it can offer large returns. Small-cap investing involves buying stocks of small companies with smaller market capitalization. Many financial investors and advisors are attracted to small-cap stocks due to their ability to go unnoticed. Oppositely, large-cap stocks will often have inflated prices because they are often being closely watched. There are many reasons why small-cap stocks receive less attention than large-cap stocks for many reasons, such as the fact that investors stay away from their small-cap risks and institutional investors have restrictions when it comes to investing in small-cap companies. Small-cap investing should only be used by more experienced investors, as these stocks are more volatile and complex to trade. What returns are you in searching to achieve? What are the investment funds being used for? By answering these questions, investors will be better enabled to build strong portfolios.When investors identify what they will break down between cash, fixed-income securities and stocks is an effective and efficient start towards developing a seamless investment strategy. The breakdown of an investors asset allocation solely depends on their risk tolerance. In terms of specific investment strategies within an investors allocations, if they are high-risk with a long investment horizon, they may want to include small-cap and growth investing in their portfolios. However, if investors have a moderate risk tolerance and a shorter investment horizon value or income investing. If they have a low tolerance for risk and a short income horizon, they may want to create their objective around income investing only. Lastly, for investors looking for companies that are likely to do no harm, adding socially responsible assets to their portfolio easily. Choosing an investment strategy that works can be a challenge for advisors, which is why it is important to choose one they are comfortable with. If you are an advisor or investor that needs help with choosing the best investment strategies? If so, AlphaDroid can help! AlphaDroid is a premier investment portfolio management software that uses sector investment strategies to provide investors with a systematic and disciplined way of capturing the best days while avoiding the worst. Using Alpha Droid, investors can create portfolios with a collection of up to 12 strategies, each with a specific allocation weight. AlphaDroid serves as an overall performance analysis tool for the collection of strategies investors use to manage a client account. Interested in learning more about AlphaDroid, visit our site today!